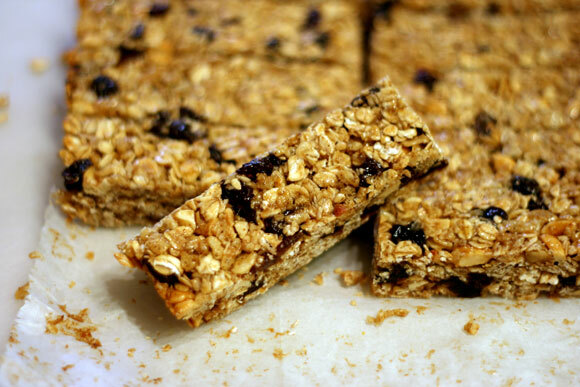 This Oatmeal Raisin Granola Bars recipe if one of my favorites. They are very quick to make and are kept fresh in the refrigerator. They hold up well at room temperature, so they are great to take with you for an on-the-go snack. This recipe is easily doubled and baked in a 9X13 inch dish. Preheat oven to 350°F. Line an 8X8 inch pan with parchment paper, letting it hang over the edges slightly. Spray the parchment with non-stick spray. Combine oats, cereal, nut and raisins together in a large bowl. Combine homey, vanilla, salt, cinnamon and peanut butter together in a medium bowl. Pour into the large bowl with the oat mixture. Fold together until completely combined. Press firmly into the prepared pan. Bake 20-25 minutes for chewy and 25-30 minutes for crunchy. Press with a lightly oiled spatula right when they come out of the oven. Let cool completely before cutting. *Note: Use gluten free oats and puffed rice cereal if you need it to be gluten free.